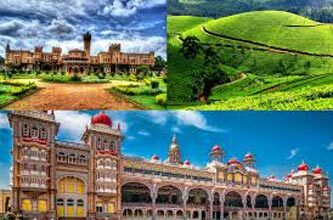 Sir Vishveshwaraya Museum- Lalbaug- Bull temple- Ulsoor lake- Vidhan Soudha and Museum-Bandipur and Mudumalai wild life sanctuary-Chamundeswari temple- Mysore Palace- Art Gallery. 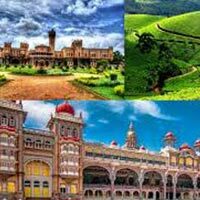 Morning arrive at Bangalore and check into hotel after refreshment see local sightseeing cover Sir Vishveshwaraya Museum, Lalbaug, Bull temple, Ulsoor lake, Vidhan Soudha and Museum. O/N stay at Banglore. Morning after breakfast dept to Ooty. On the way see Bandipur and Mudumalai wildlife sanctuary. O/N stay at Ooty. Morning after breakfast proceed to Mysore. On arrival check into hotel. afternoon see Mysore Zoo, and evening see Brindavan Fountain Garden. O/N stay at Mysore. Morning after breakfast free for Shopping and in the afternoon dept to Bangalore.Arrive in Bangalore & dept to Mumbai by train/flight.